With the fallout from cyber-bullying and sexting regularly hitting the front pages - unfortunately in most cases when the ultimate price has already been paid – you would have thought it would be easy to engage parents/careers when it comes to trying to combat the issue. However, this is not always the case, and with Ofsted now recommending that parents attend regular e-safety sessions schools are under increasing pressure. The difficulties arise because parents/carers don’t know what they don’t know. They are, rightly so, trusting of their children and also feel overwhelmed by some of the new technologies that they are using. Many adults turn to the younger generation to help them sort out their own technical problems and believe that they have a lot more knowledge than they themselves do. This can lead them to feeling vunerable and not wanting to appear as though they don’t understand this technical world around them. It isn’t always that parents/carers don’t want to get involved, but they need help to understand the issues and how they can affect their children. Often, when you have the opportunity to explain these issues further and to explore them in more detail, it’s as though the ‘penny drops’ and you can see them nodding and beginning to recognise some of the behaviours they have seen in their children. Let’s face it, why would parents/carers understand issues such as sexting? This is a whole new way of ‘courting’ that they themselves would never have experienced. If you don’t understand the issues, then you can’t be expected to help, guide and support. A classic example that highlights a combination of parents’ trusting their children and not understanding the full implications of their online activity took place at a boarding school recently. A pupil rang her mum to say that a friend of hers had put a post on Facebook to invite friends to a party at his house. He had put a picture of the house, full address, directions and description of the street, house everything - so that people could find it. Her mum immediately rang the school to report the issue, but the response from the parent whose child has posted the invitation was not one of shock/horror that the boy had posted this information on Facebook, but that he had been told he could only invite a few friends and should never have invited more than about six. They totally missed the implication of what he had done! This kind of story - alongside the fact that much of a child’s online activity will take place outside of school hours, is why schools working to get parents involved in safeguarding their children (and themselves) online - forms a key part of the new e-safety guidelines. Just as parents/carers may be chasing the next new smart phone, children are always on the look out for the next new app to communicate with friends, and it doesn’t take long for an app to go viral. We can’t expect parents to always be on top of this which is why it is important for them to get that information from a third party; someone who can point them in the right direction to get the information they need, who can teach them the new terminologies and tell them where to go if they need help. Through attending a school-hosted e-safety awareness session for just 1.5 hours, a couple of times a year, parent/carers can learn all they need to know to raise their own awareness and to not feel as though they are miles behind their children’s knowledge. When this is backed up with regular updates and even parent training courses, they will also feel supported when they tackle the topic with their children. After all, a parent with knowledge and understanding, is a parent with power. Visit our partners page to find out more about the face-to-face sessions available from Fantastict. You can also find out more about the parent engagement resources and online training for parents available from E-safety Support. 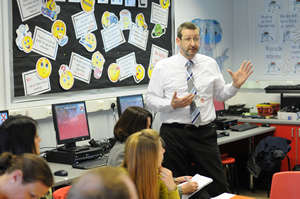 As part of our partnership with Fantastict, a national provider of educational consulting and training services, Joe Basketts, Education Director at Fantastict, shares his thoughts on e-safety strategy. The new briefing paper from Ofsted (released September 2013), is much more detailed and comprehensive than previous, making specific reference to an e-safety curriculum, how parents are engaged, training for staff and how the school website can contribute to informing parents and keeping them up to date. Reference is also made to schools that have obtained the E-Safety Mark or other recognised standard. Understanding responsibilities with regard to e-safety is the first step towards achieving Good or Outstanding practice. However, the critical success factors lie in having the knowledge and skills to translate this understanding into workable strategies and processes within the school environment. There is a wealth of support available to assist schools in raising e-safety standards in line with the new guidance, an excellent example of this being E-Safety Support. Given the breadth of materials and sources available, it can sometimes be difficult to navigate the choices and identify which are most relevant to specific needs or will help address the most pressing issues. At the same time, some learning experiences are much more effective when supported by directed or face-to-face training. For example, online resources are excellent for providing insight into a topic, but cannot replace valuable peer-to-peer engagement which can only truly be realised through group workshops. In the same way as some content is better delivered in a workshop environment, when it comes to e-safety and indeed wider ICT and school strategies, external benchmarking will also provide great insight and a fresh perspective. For example, 360 Safe is a leading audit tool which can give a complete picture of a school’s current e-safety policy and practice. Working with an approved 360 Safe consultant, the school can then prepare a development plan which ensures the very best practice according to Ofsted guidelines. As with any aspect of school operations, understanding where you are as compared to where you need and want to be, is an essential part of strategy development – and a process where an external viewpoint and objectivity can help save a lot of valuable time and add significant value. Since the launch of E-safety Support earlier this year, we have had the pleasure of talking to many schools about the e-safety issues they are currently facing. One of the biggest challenges identified by our member schools was teacher training. As a result of your needs, we have partnered up with the UK’s largest dedicated provider of e-safety training and consultancy – Fantastict. This new partnership will not only give teachers and schools access to a nationwide network of trainers and consultants, but all E-safety Support members will also benefit from a free ‘Needs Analysis’ consultation. Premium and Premium Plus members will also receive discount off any training and consultancy booked with Fantastict. Responding to our member needs is part of our commitment to ensure that the whole school community can be involved in the delivery of the school e-safety provision. By partnering with Fantastict, we can help schools access quality e-safety training which will ensure that teachers are aware of current e-safety issues, supporting them in school and complementing the teaching and learning materials available from the E-safety Support website.